The 24 Hours of LeMons, Jalopnik's favorite weekend racing series of vehicles ostensibly assembled for $500, has drawn protests from Miami-area Cubans over using pictures of Che Guevara in an offhand fashion. ¡VENCEREMOS! UPDATE: Che may have been banished. The Palm Beach Post, your daily socialist news journal powered by intrusive Range Rover ads, says the "joke of a car race" has upset some southern Floridians by naming its December event the "24 Horas de Cuba del Norte (24 Hours of Cuba of the North) and using images of Ernesto "Che" Guevara, the guerrilla leader who helped Fidel Castro overthrow Cuba. "When I saw it, I said, 'That's totally insulting,' " said racing promoter Ralph Sanchez...."They don't understand the history of what this man has done." The Post reports "several" complaints, while race honcho Jay Lamm says he's gotten "about a dozen." 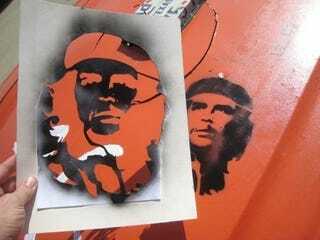 Che's likeness has already been used in several LeMons races, along with Karl Marx, John Wilkes Booth and other historical references. LeMons is like Glenn Beck's blackboard, but cogent. LeMons racers are not "decked out to look like a Halloween parade float." People outside of Palm Beach do not mark Halloween with parades, and LeMons racers are decked out to look like Day of the Dead parade floats commandeered by sentient badgers with grudges against humanity. "If some people take offense at an icon we're using sarcastically, that's an unfortunate but natural byproduct of humor; if they don't understand that we're on the same side as they are, I can't help that," he wrote. "I would note, however, that these are often the very same people who (are) offended by other images we've used (Appalachians, Coloradoans and recovering alcoholics, to name just a few) (and) that America was not founded on political correctness, nor on a reluctance to offend certain parties. UPDATE: The Palm Beach International Raceway where the LeMons race is to be held says Che's getting the boot. "We have worked with the promoters to change the title and all artwork to something non-offensive to all of our fans and racers," says president Jason Rittenberry. When we hear anything official, we'll update further.